Send your thoughts aflutter with this set of bird-themed brain teasers. It's hard taking a peck at a new project as the day drags on. Step back and take a bird's-eye view of even your most challenging assignment when you send your thoughts aflutter with this set of bird-themed brainteasers. The object of this puzzle is to form a specific bird shape, given only in silhouette, using all 9 puzzle pieces without overlapping any of them. Each set includes 40 glossy silhouette cards printed in vibrant, easy to discern colors. The cards contain puzzles of varying degrees of difficulty to challenge tangramists of all skill levels, with solutions to each puzzle printed on the back of the card. 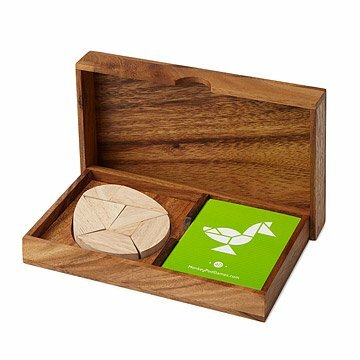 Attractive enough to perch permanently on your desk, this tangram set is constructed of beautifully handcrafted monkey-pod wood, making it the perfect piece of "playable art". The wooden puzzle pieces, known as tans, are cut thickly and precisely to ensure success - all you need to do is take a crack at it. Wooden parts are handmade in Thailand, item is packaged in the USA. The pieces do not have standard units of length so they do not fit together properly when solving the puzzle. In other words, the pieces do not fit flush when solving a puzzle making it seem like you do not have the right solution if even you do. The box, cards, and puzzle pieces are nice quality beyond that not so great. It's as challenging or a little more challenging than usual anagrams. Really engages ones spatial skills. My father is a wiz and this puzzle actually challenges him. I would highly recommend this puzzle. It comes in a nice wooden box and is beautifully made. It is a Christmas gift so I havent given it to my son yet! Husband likes this Christmas present. It's high quality craftsmanship with a challenging set of puzzles to complete.